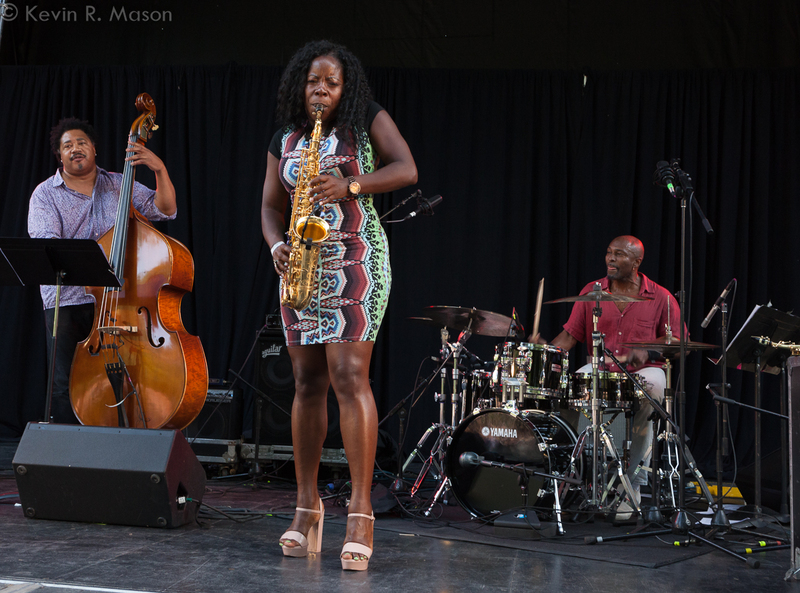 For those who are looking forward to warmer weather and outdoor jazz festivals, here’s a look back at two of the best of 2017’s mid-sized festivals in New York. These festivals, attended by hundreds and even thousands, brought high-quality music to the public, and made jazz more accessible to fans in the New York tri-state area. 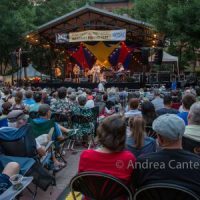 The 25th Charlie Parker Jazz Festival took place from August 23 to 27, with concerts, dance recitals, interviews, open jam sessions, and a film screening, and all the events were free! 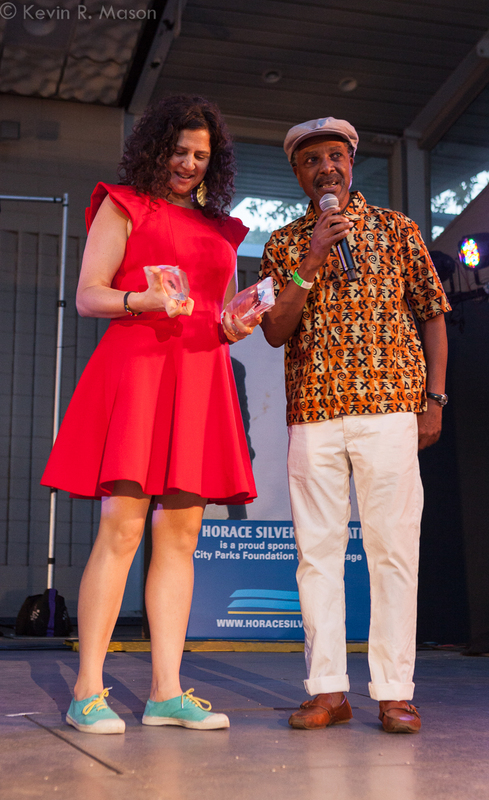 Part of City Parks Foundation’s SummerStage program, the shows took place all over Manhattan, and the big weekend concerts started at Harlem’s Marcus Garvey Park. Anat Cohen Tentet. The weather was flawless on the evening of the concert by the Anat Cohen Tentet, and the music was as great as the weather. 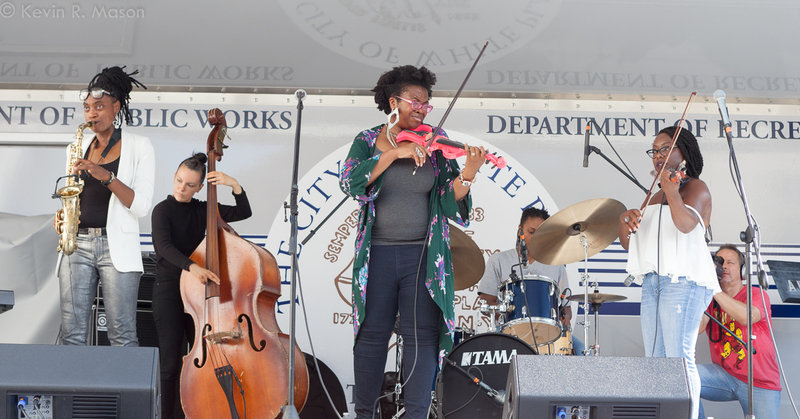 This concert was presented in association with Jazzmobile, a not-for-profit arts and cultural organization that has been bringing great performances and educational programs to area residents and tourists visiting New York City for over 50 years. Clad in a brilliantly red dress, Anat Cohen then took the stage with her Musical Director, Oded Lev-Ari and backing musicians, cellist Christopher Hoffman, trumpeter Stuart Mack, trombonist Nick Finzer, Owen Broder on baritone sax and bass clarinet, James Shipp on vibraphone and percussion, Vitor Gonçalves on piano and accordion, guitarist Idan Morim, bassist Joe Martin, and drummer Anthony Pinciotti. The group had a beautifully rich sound, on songs like “Loro,” “Goodbye,” “Anat’s Doina,” and “Oh Baby.” They went from sounding like a big band to enrapturing the crowd with an accordion-filled number reminiscent of something you could hear while strolling through Paris. They also played Dixieland with ease and style. So outstanding was her direction and musicianship, that Anat was like a Pied Piper, with the audience willing to follow wherever she chose to go, including some very energetic Klezmer music. Whatever some politicians, say, or what dire headlines are in the news, this concert showed that an audience of multiple ethnic backgrounds can peacefully listen to music played by musicians from all over the world. The Anat Cohen Tentet beautifully exemplified the international nature of jazz, demonstrating that musical talent is universal. Erica Elliott, Artistic Director of the Festival, welcomed the crowd, and said how proud she was of the day’s line-up. WBGO Radio’s Sheila Anderson was the host of the day, and she spoke about the history of the Festival, then introduced the first act of the day. 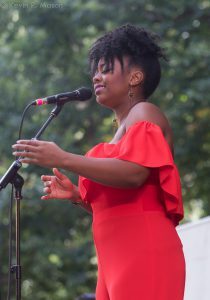 Charenée Wade. 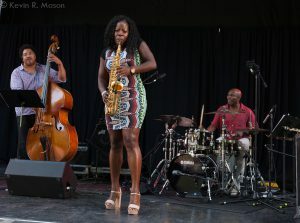 Lakecia Benjamin started the set with an electrifying saxophone solo. 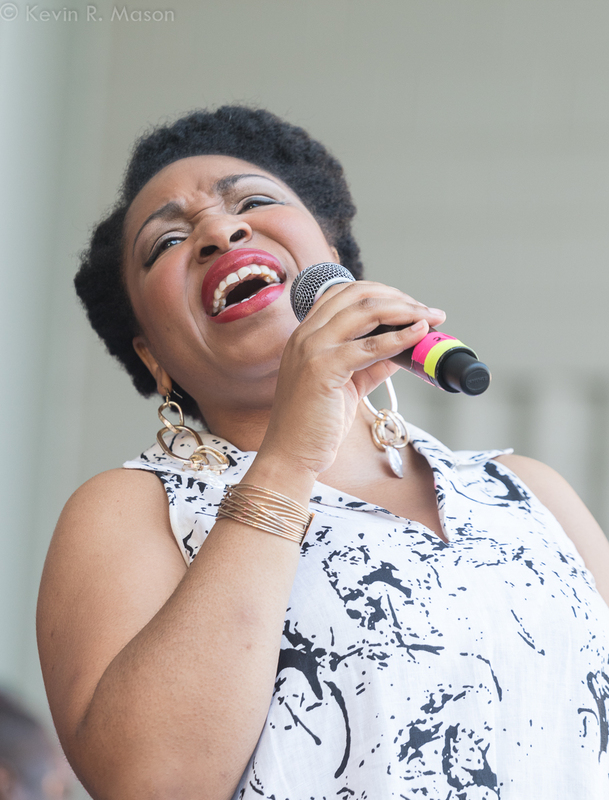 Then vocalist Charenée Wade came out and welcomed everyone, informing the audience that they’d be playing songs from her CD, Offering: The Music of Gil Scott-Heron and Brian Jackson. The set also included a song in remembrance of the wisdom of our ancestors, “Song of the Wind,” and Charenée said, “You can’t know where you’re going until you know where you come from.” Throughout the show, Wade sang her heart out, and her band, including pianist Oscar Perez and drummer Jonathan Blake, matched her note for note. The finale was “Essex,” a powerful prayer for peace. 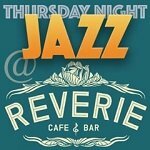 Louis Hayes Quintet. 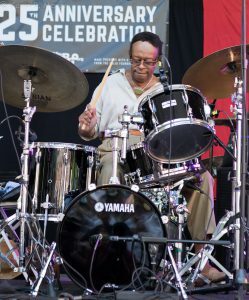 Drummer Louis Hayes (who is 80 years old, but looks nowhere near his age) said, “It’s really wonderful to be here; it couldn’t be any better.” Selections included songs from Hayes’ CD, Serenade for Horace. 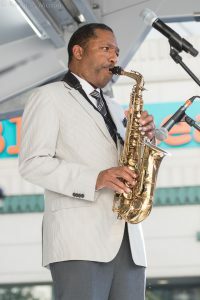 Hayes made his recording debut with Silver in the 1950s, as a member of the Horace Silver Quintet. “Hastings Street” was named for a street in Louis’ hometown of Detroit, and it featured a great vibraphone solo by Steve Nelson. 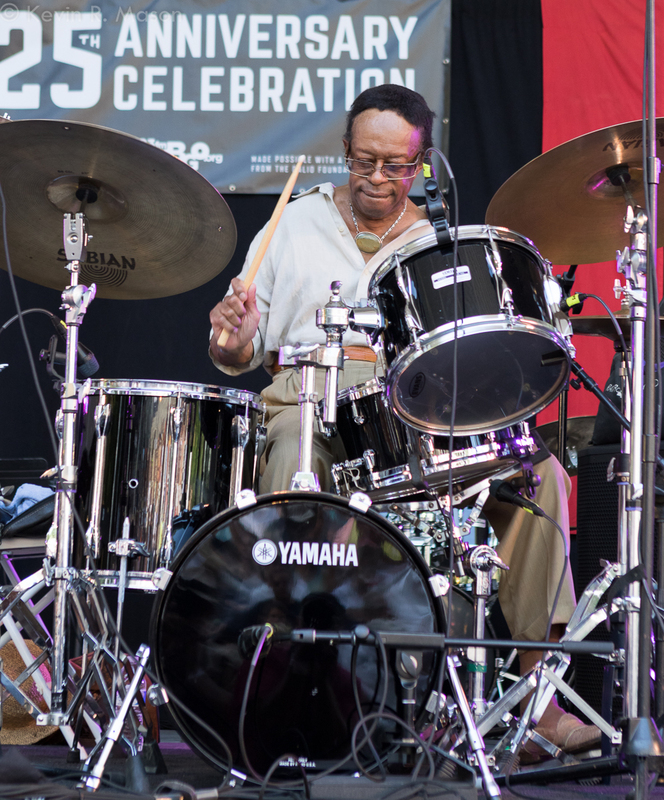 The set’s final song was a real up-tempo pleasure, Horace Silver’s “Cookin’ at the Continental.” Whatever magic there is in music that keeps some musicians so youthful, it’s certainly working with Louis Hayes, who hasn’t lost one step in seven decades on the drums. 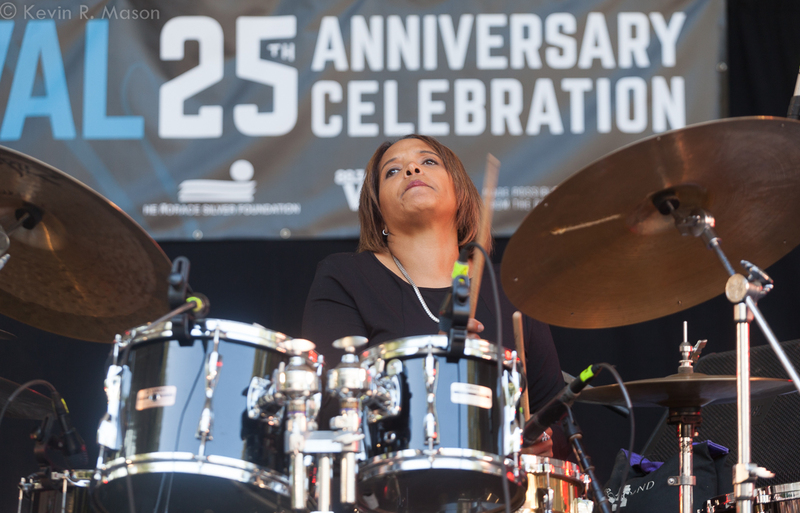 Terri Lyne Carrington & Social Science. This set was filled with spoken-word poetry and protest music. The audience reacted strongly to a beautifully elegiac song that was inspired by the presidential election, with the haunting lyrics, “complacency has its price.” “Bells” was written about the police shooting of Philando Castile in Minnesota. Both songs were imbued with so much relatable humanity, despite their painful subjects. They then changed the tone of the music with Joni Mitchell’s “Love,” as well as “Trapped in a Dream.” Carrington said that it was such an honor to be there and to play between living legends Louis Hayes and Lee Konitz. Lee Konitz Quartet. At 90, composer and saxophonist Lee Konitz retains a salty sense of humor, and got a laugh from the audience when a sound techie took some pains to adjust his microphone. After a few seconds, Lee walked away and played for a bit out of range. The concert included “What is This Thing Called Love,” “All the Things You Are,” “Stella By Starlight,” and “’Round Midnight.” On “Body and Soul,” Lee scatted a bit, then played a lovely rendition of the American Songbook classic, with splendid tones from his sax. 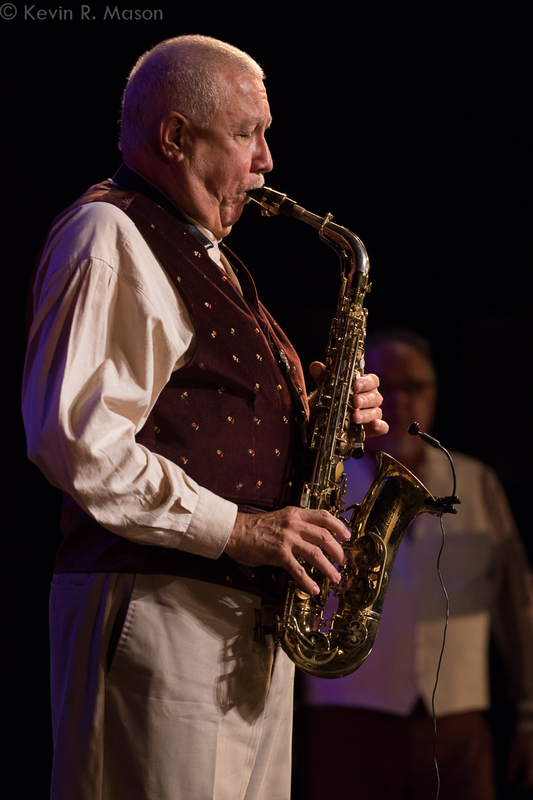 After a heartfelt ovation for this jazz icon, Konitz performed a witty scatting duet with his pianist (Dan Tepfer) that utterly charmed the audience and ended the day of music in style! The last day of the Festival took place at Tompkins Square Park in the East Village. 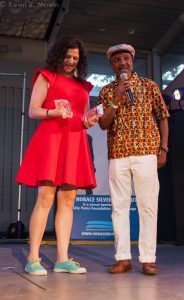 Alicia Olatuja. Vocalist Alicia Olatuja had played a few previous Festival sets, but this was her debut as a leader of her own show. Dressed in a vibrant red jumpsuit, she started with “Esperanza,” which means “hope” in Portuguese, and said we all can use hope these days. She commented on the weather, saying, “This is the perfect day. Come on!” She also talked about the news, but said that despite all the distressing stories, there is comfort in the fact that everything must change, and you can’t stop progress. She segued into a beautiful duet of “Everything Must Change” with guitarist David Rosenthal. The band also performed a twist on Michael Jackson’s “Human Nature.” Alicia closed her set with “Amazing Grace,” which she started a capella, then was joined by her band members, one by one. She must have studied at the School of Dianne Reeves, who is famous for singing the names of her band members, because Ms. Olatuja did the same thing. And indeed, why not borrow from the best, and surely Dianne would be flattered. Each musician got a solo spot as they were introduced, and their jazz-infused version of the hymn was a thing of beauty! Lou Donaldson Quartet. 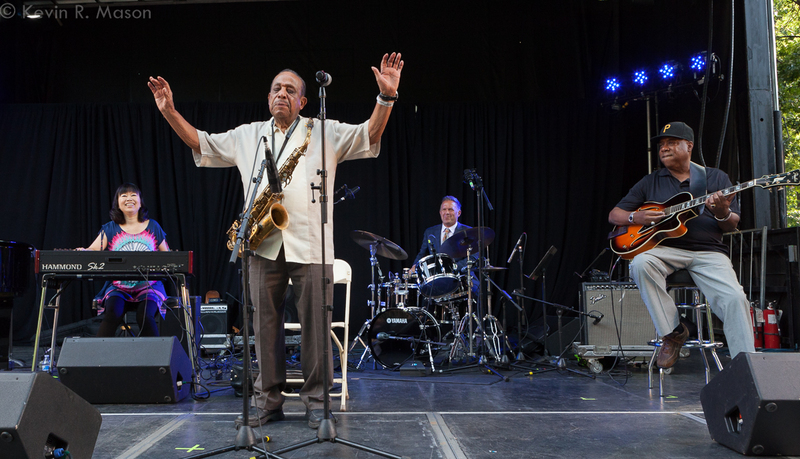 Saxophonist Lou Donaldson is as sharp-witted and sharp-tongued as ever at 91 years old. He went on a rant about not playing any fusion, so there wouldn’t be any “confusion” and had some pointed criticisms about rap music. 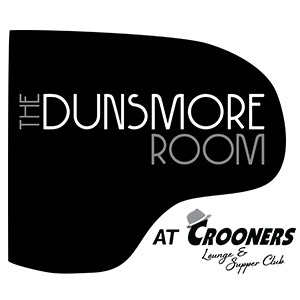 It was a bit of a rough start to the show, but age does have its privileges, and Lou Donaldson is clearly at an age where he doesn’t censor his words at all. He even told a risqué story about Viagra that had the audience in stitches. 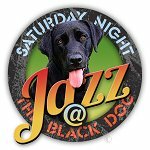 Then, along with bass guitarist Eric Johnson, drummer Joe Farnsworth, and pianist Akiko Tsuruga, Donaldson played “What a Wonderful World” in honor of Louis Armstrong, whom he said was “the greatest musician in the world.” He told anecdotes about Armstrong, and credited him with making jazz popular. Lou was also full of praise for Charlie Parker, saying, “Charlie Parker was the blues master. Even with all the other great music he played, nothing topped the blues.” The set included “Whiskey Drinking Woman,” a hilarious song where Lou sang about a woman who was known to have a drink or two! The encore was “Alligator Boogaloo,” and one woman danced near the stage so provocatively that even the outspoken Lou was momentarily speechless, watching her every move. Despite the set going a few minutes over, the crowd ate up the music and the spectacle. 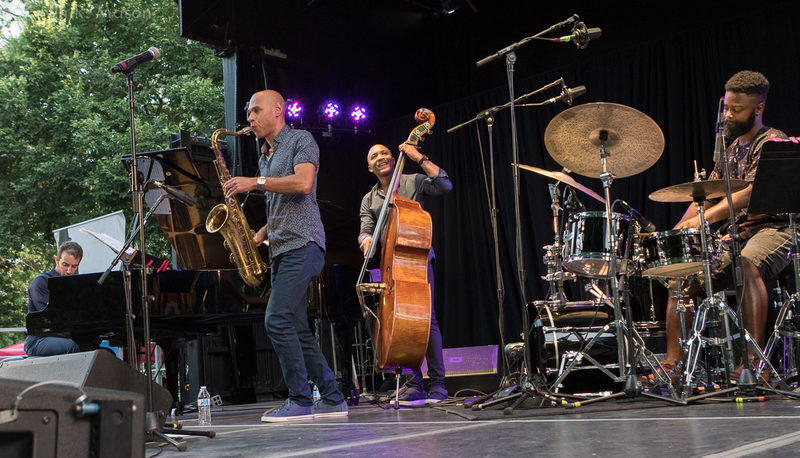 Joshua Redman Quartet. There was a verbal altercation at the beginning, due to a group of latecomers who congregated in front of some seated patrons and needed to be cleared out by security. Fortunately, the Joshua Redman Quartet started at such a high level of musicianship, that the seating kerfuffle was soon forgotten. Midway through the set that included “Rats,” “How We Do,” “Borrowed Eyes” “Disco Ears,” and “Stardust,” Joshua joked that he’d like to hang out for a while, chat, and read poetry, but since the group had a hard curfew at 7:00 pm, they were just going to play as much music as they could. 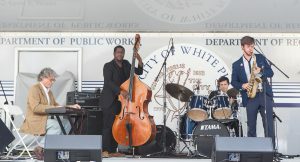 With pianist Aaron Goldberg, bassist Reuben Rogers, and drummer Marcus Gilmore, Redman also played some Charlie Parker compositions, saying, “You can’t play the Charlie Parker Jazz Festival and not play some Bird music.” The Joshua Redman Quartet ended the day and the Festival in the most excellent manner. 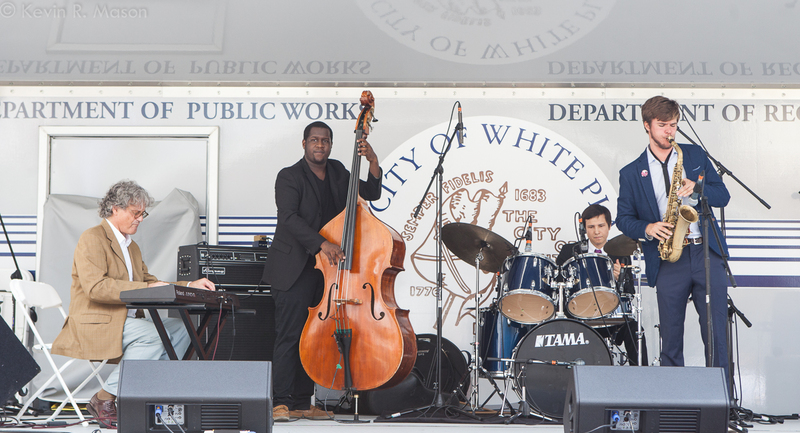 The sixth year of the White Plains Jazz Festival took place over five days, from September 13 to 17, and included concerts, sets, pub crawls, open mics, and jam sessions at different locations in the Westchester County city of White Plains. Most of the events were free of charge. 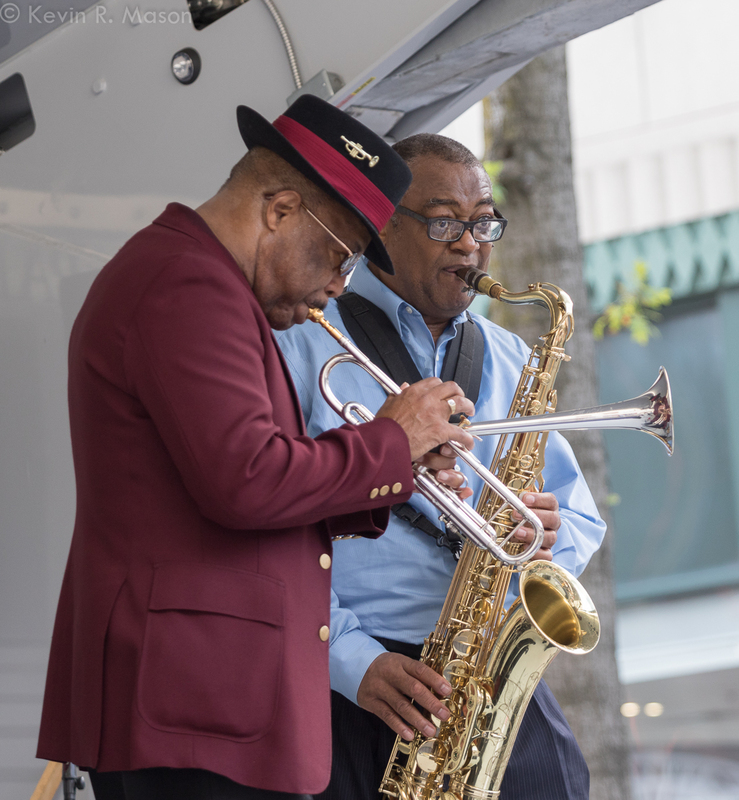 The week-long Festival culminated in an all-day outdoor jazz and food celebration. Paquito D’Rivera Quintet. 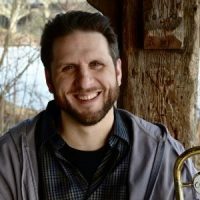 Composer and multi-instrumentalist Paquito D’Rivera said he was thrilled to be there with “these excellent musicians,” pianist Daniel Freiberg, trumpeter/trombonist Diego Urcola, bassist Zach Brown, and drummer/percussionist, Mark Walker. Paquito announced that part of the concert was a tribute to John Birks, aka Dizzy Gillespie, and played a beautiful bossa nova, “I Remember Dizzy,” with a funny “Salt Peanuts” coda. “A Night in Tunisia” is a must at any Dizzy Gillespie tribute, and the band really did the song justice. The concert continued with a lovely, introspective number, “Song for Maura,” written for Paquito’s mother, from the CD of the same name that won him two Grammy Awards. He quipped that someone else should have been able to win a Grammy that day, but what was he going to do, give one away? On “Oye Cómo Va,” the audience broke into a spontaneous sing-along, and when Paquito asked who wrote the song, someone called out, “Tito Puente!” which led to applause for Tito. After an intermission, the group launched into a surprising and unexpected interpretation of a Mozart concerto, and continued with “Mambo Inn.” In addition to being a stellar musician, Paquito D’Rivera has an abundance of stage presence, charisma, charm, and a puckish sense of humor. He’s like the guest everyone wants at their party, and he and his fellow musicians certainly brought the party to the stage at the White Plains Performing Arts Center. 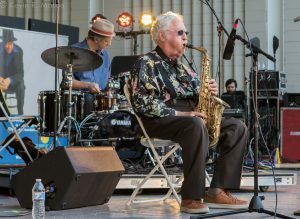 Artistic Director of the Festival, Tom van Buren, welcomed the crowd to the all-day outdoor jazz and food fair, saying, “We’re bringing you a great day of jazz, following a great week of jazz.” He thanked the sponsors and introduced the first group of the day. SUNY Purchase Jazz All-Stars. 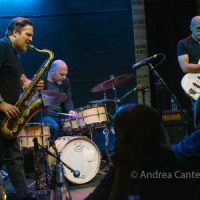 Pianist/composer Pete Malinverni was joined by bassist Jason Clotter, drummer Daniel Criado, and saxophonist Nick Green in a fine set of jazz standards and bebop to kick off the festivities of the day. The show included “Sophisticated Lady,” which was dedicated to Duke Ellington and Billy Strayhorn, and an excellent blues rendition of “Things Ain’t What They Used to Be.” There was great chemistry and communication between the musicians, and Nick Green did a cute vocal riff to Jason Clotter’s solo. Steve Kroon and His Latin Jazz Ensemble. Percussionist Steve Kroon told the crowd, “Don’t be afraid to dance now. If you want to dance, you have my permission. Get down!” The music was even more persuasive; it was so enthralling that even an older man with a cane got up to dance. The Latin Jazz Ensemble included Craig Rivers on saxophone and flute, drummer Joel Mateo, keyboardist Igor Atalita, bass guitarist Waldo Chavez, and vibraphonist Bryan Carrott. It was already a hot, end-of-summer day, and the incendiary music of the group was a perfect match for the weather. They played “Monterey,” “Day at the Beach,” and “Mizu,” and took the audience on a musical trip to Brazil and other parts of the globe. A guest star, young multi-instrumentalist Gabrielle Garo, is a budding musician Steve has known since she was a baby, and she lived up to her early promise that Kroon observed over the years. The final song of the set, “Amigos,” featured Gabrielle in some fine solo work on flute. Sage. After Steve Kroon metaphorically set the stage on fire, the all-female group Sage kept the blaze going! Their concert included high-energy versions of “Master Blaster (Jammin’)” and “Papa Was a Rolling Stone.” Even ballads like “People Make the World Go ‘Round” had palpable, remarkable vigor. 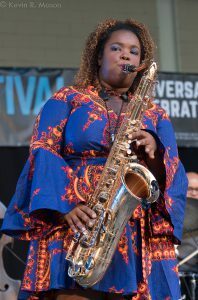 Sage was comprised of saxophonist Lakecia Benjamin, pianist Miki Hayama, violinist Kersten Stevens, drummer Shirazette Tinnin, and bassist Renee Cruz. 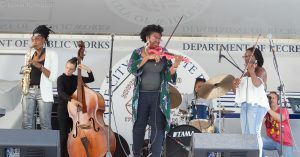 Guest violinist and powerful vocalist “Charisa the ViolinDiva” brought a hot-pink, custom-made violin on stage with her and proceeded to tear it up with the other musicians. It was a memorable show in an afternoon of excellent music. Donald Harrison. The Mayor of White Plains, Thomas M. Roach, thanked everyone for coming out, and added, “We couldn’t keep having this Festival without you!” He introduced Wayne Bass, Commissioner of Recreation and Parks, as the heart and soul of the Festival, and Wayne, in turn, praised Tom van Buren, the Festival’s Artistic Director. Then, the final act of the Festival, New Orleans saxophonist and band leader Donald Harrison took the stage, with keyboardist Zaccai Curtis, bass guitarist Jon Benitez, drummer Darryl Staves, and guest Nestor Torres on flute. The concert started with “Chillin’ at the Penthouse” and “Feel Like Making Love.” At one point, Donald said he was going to introduce the band, and in a funny bit, he introduced them to each other, before he introduced them to the audience. Harrison sang “When You’re Smiling,” and even when he forgot some of the words, he managed to entertain the crowd. The set ended with “Cherokee,” and the encore was “Maple Leaf Rag.” This concert was a fittingly outstanding finish to the wonderfully varied White Plains Jazz Festival!